Is anyone else seeing this issue? Any thoughts on how to address it? Perhaps reduce the HC aggression sliders on offense even more? Would love to hear others thoughts and analysis on this. From my experience, CPU vs CPU stats and sim stats don't work well together, NZA' editor helps but still. CPU vs CPU for all games is consistent but most don't want to do that for all games. I might actually start doing all CPU vs. CPU instead of simming games from my season 2 onwards. I've been using the cpu vs cpu speed option #2, it's really cool. It only takes like 10-12 mins to sim a game, quite easily to get a week done in a day if you have the time. Brock wrote: I've been using the cpu vs cpu speed option #2, it's really cool. It only takes like 10-12 mins to sim a game, quite easily to get a week done in a day if you have the time. Exactly! With Cal’s Scripts, you don’t need to sim anything, the games just plays out twice the speed. That was my idea:-) No need to sim any games anymore. I've also been enjoying your sliders/guide as well. Thanks for them. Love cpu vs cpu games. I also realized that you used to post on OS, I used one of your slider sets for NCAA 06 as a base for my own. I did, I've moved away from console games for sports many years ago, strictly PC. 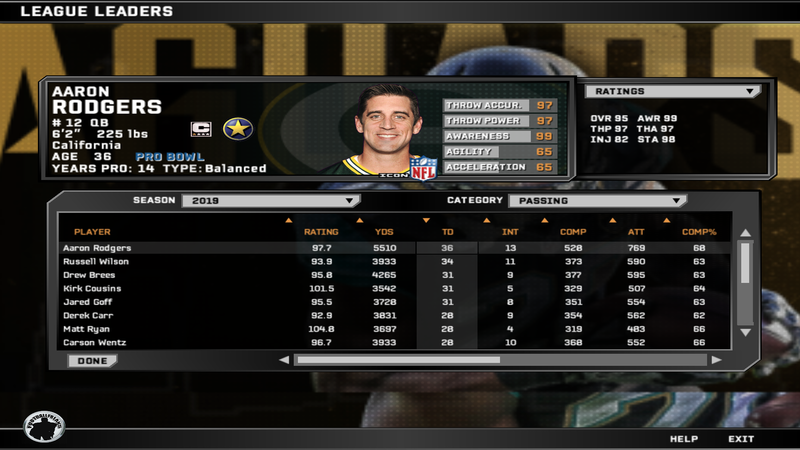 OK, thanks to the feedback in this thread I think I have this figured out now to the point where I can get very realistic QB stats from the fast sim games throughout the season. Also using NZA's editor you need to use the feature at the start of the season that adjusts all the coaches run/pass and conservative/aggressive settings to cause more 4,000 yard passing seasons. Another setting that I think might be important is the Def Pass Interference penalty slider setting which I set at 97 (I believe this causes the DBs to play less aggressive and therefore results in less interceptions). If you compare those above numbers, they are very close to the real NFL QB stats from this past season. I am going to employ these settings in my franchise. 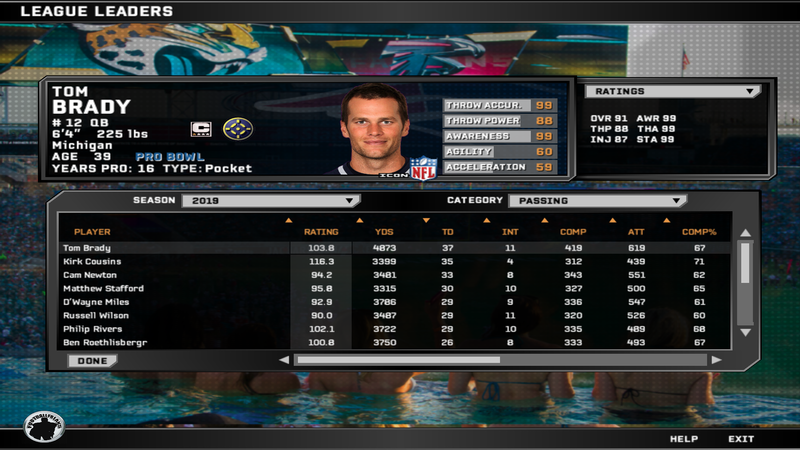 KeepinItTeal wrote: OK, thanks to the feedback in this thread I think I have this figured out now to the point where I can get very realistic QB stats from the fast sim games throughout the season. That certainly looks interesting. I'd say this is very important only if your mostly use fast sim. If you use slow sim (aka CPU vs. CPU) this isn't as critical. On the other hand, the Defensive Pass Interference slider is important. Running at 99 makes the DBs play the ball way too much. IRL you don't see defenders swatting away the ball everytime. I run DPI at 80 (Also, OPI at 99 as that makes the receiver go for the ball more aggressively) and the DBs consistently play the receiver with the receiver usually making catches in coverage if the DB isn't looking at the ball. This results in more catches and less INts. Also in more big hits by strong safeties and coverage linebackers that cause dropped passes. This is only important when you run slow sim, or CPU vs. CPU, Coach Mode any actual non-fast simmed game. Otherwise there is no effect. Also, 80 DPI still triggers the same amount of DPI calls as 99 DPI. There are still the uncalled blatant DPI in both settings. with DPI at 80 I can safely run Defensive Awareness at 40 and see completed passes. And you can actually see that it is not perfect. How isthat Brady has 11 INTs but Kirk Cousins just 4 and Aaron Rodgers 14? ... Well ... is Madden 08, there is a lot of stuff done wrong in this game. As an additional, how does your CPU vs. CPU games look like when it comes to big play giveaways? Like, every game I see CPU vs. CPU, there is usually around 3-4 huge 60+ gains with TDs included because the CPU seems to call way too many blitzes and/or blown coverages. I use the default defensive aggression of 50, so taht could be a reason, how does it look on your end with NZA's HC adjustments?